a two-and-one-half-acre wave-making lagoon with surfing-size waves. In a Typhoon Lagoon exclusive, guests come face-to-face with all the colorful creatures of the Caribbean when they snorkel in Shark Reef, a saltwater pool presented by NAUI (National Association of Underwater Instructors). The park also features a water playground for children, sunny beaches and lazy streams surrounding a 95-foot mountain. The water-entertainment area takes its theme from a legend of romance and danger evident with Miss Tilly, the wrecked shrimp boat storm-stranded on the mountain peak. “Upon entering Typhoon Lagoon, guests find themselves in a ramshackle, tin-roofed island village landscaped with cargo, surfboards and other marine wreckage left by the great storm,” said Eric Jacobson, senior vice president of Creative Development for Walt Disney Imagineering. Towering behind the lagoon is Mt. Mayday, “landscaped” with a number of thrill-and-spill water slides. Topping the mountain is a shipwrecked shrimp boat (Miss Tilly out of Safen Sound, Fla.), left dangling crazily 95 feet in the air by the force of the legendary typhoon. • Humunga Kowabunga’s three water slides which drop guests down the mountain and through rocky caverns at speeds up to 30 mph. • Storm Slides, consisting of three curving body slides called Rudder Buster, Stern Burner and Jib Jammer, take guests past assorted nautical flotsam before depositing them into a pool at the bottom of the mountain. • Three rafting adventures — Mayday Falls provides guests with a white-water experience; Keelhaul Falls boasts a triple vortex that literally adds new “twists” to riding the rapids; Gangplank Falls enables families to ride together on three- to five-passenger rafts. In addition to the mountain, with its water-smoothed rock flumes and other rideable waterways, the mythical cataclysm left behind the surfing lagoon — twice the size of a football field and large enough to encompass an ocean liner. The lagoon also boasts one of the world’s largest artificially created waves for body surfing. Just on the opposite side of the surfing lagoon is Crush ‘n’ Gusher, a water coaster thrill ride weaving among the washed-out remains (so the story goes) of a dilapidated fruit packing plant. Three out-of-control wash spillways with torrents of gushing water propel the most daring of raft riders on an extreme gravity defying adventure up and down twisting caverns that lead to the tranquil waters of Hideaway Bay. Ketchakiddee Creek is a water playground adjacent to Mt. Mayday. Geysers, fountains, bubblers, slides, three interactive boats and a pint-sized white-water rafting adventure cater to young children and families. The aquatic world of the Caribbean comes alive in Shark Reef, a 362,000-gallon saltwater pool where snorkelers swim fin-to-fin with exotic marine life including butterfly fish, French angels, tangs, groupers and even nurse sharks. Other guests have the opportunity to watch snorkelers through the underwater portholes of a wrecked ship in the center of the reef. Nearby, Hammerhead Fred’s Dive Shop provides necessary underwater equipment for Shark Reef, including wet suits, masks and snorkels. Changing areas, lockers, showers and a picnic area are nearby. Two restaurants, Typhoon Tilly’s and Leaning Palms, serve up everything from specialty sandwiches and salads to cookies and ice cream in waffle cones. Available for a day-long rental, Beachcomber Shacks and Polar Patios are premium spaces that put a roof or a large umbrella over guests’ heads, provide upscale Adirondack seating for relaxation, put beverages to quench a whole days’ thirsts at guests’ fingertips, and give them a service attendant who does the leg work if they want to purchase food from the a la carte menu. 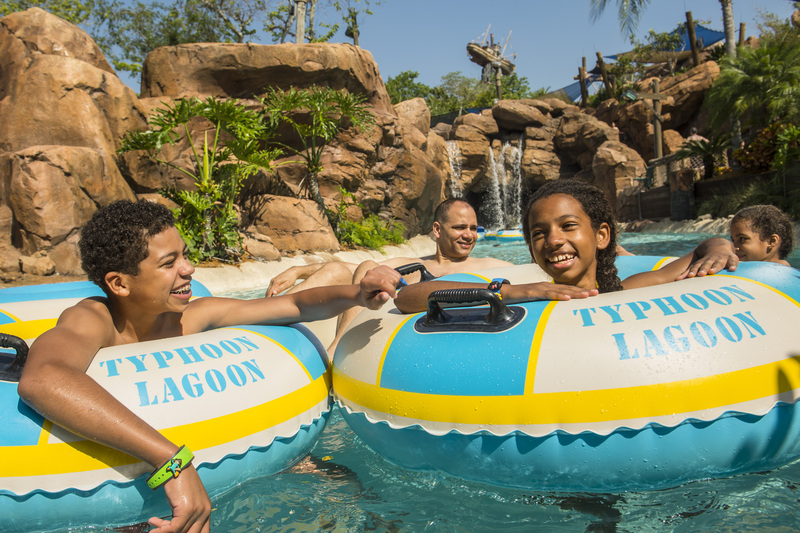 Magical DIStractions editor, Lisa McBride, posted an article, Typhoon Lagoon-A water park that’s worth gushin’ about, on April 10, 2015.